﻿ “Distributor of The Year” Neutrik (2014). InícioMídia“Distributor of The Year” Neutrik (2014). 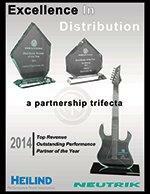 “Distributor of The Year” Neutrik (2014).